A day of studying dinosaurs and fossils was in store for the children in Key Stage 1 at Rykneld Primary as they braved the snowy conditions to make it into school. The trip was certainly worth it with one enthusiastic Year 2 pupil declaring that today had been his “best day ever”, as the children learned all about dinosaurs and fossils in a series of workshops with Everything Dinosaur. The spacious, newly constructed sports hall provided a splendid venue for the four dinosaur themed workshops. The three classes that make up the Year 1 cohort were combined together so that two lengthy workshops could be conducted in the morning. Half of Mrs Chell’s class took part in the first workshop, the remainder joined in with the second workshop that commenced later in the morning. In the afternoon, it was the turn of the ninety children that make up Year 2. Once again, in order to provide longer workshops, one class was split with half of them joining the first workshop of the afternoon and the other half taking part in the fourth and final workshop. 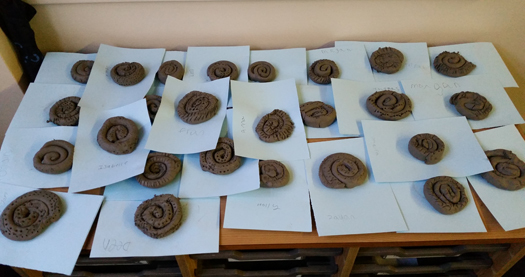 Year 1 children make clay ammonite fossils. Ammonite fossils were used to help the children learn about how fossils form and what they can tell us about life in the past. After the inspiring fossil workshop, one Year 1 class spent part of the afternoon making their own clay ammonite fossils. The Everything Dinosaur team member who conducted the dinosaur workshops was most impressed by the various spiral shapes and patterns the children had created. A big fossil close to the Ammonite Pavement. Some of the ammonites that Everything Dinosaur had brought were very large and heavy. Lucky pupils got the chance to hold these big fossils to see for themselves just how heavy (and cold) fossils can be. One of the challenges set was to help the children develop their vocabularies by thinking of words to describe some of the specimens. We had some amazing adjectives – well done Year 1 and Year 2. A “Wow” Wall in a classroom with a wonderful volcano exhibit. The well-appointed and roomy classrooms had lots of prehistoric animal themed displays. Year 4 had been studying the Stone Age and outside their classroom was a magnificent Woolly Mammoth model, complete with curly tusks. However, our favourite piece of prehistoric themed art was spotted in one of the Year 1 classrooms. The picture above shows a splendid three-dimensional volcano model, complete with lava erupting from its top. Just like Everything Dinosaur’s workshops, such wonderful art is bound to inspire and motivate the Key Stage 2 pupils.